In 2012-2013, the Dublin City Council (DCC), the governing body of the City of Dublin in Ireland, was the major project partner of the IwB. Throughout the academic year, the IwB students worked closely with DCC representatives looking at ways to strengthen and change citizen perceptions of public service delivery in Dublin. This collaboration, known as the Dublin Project, was very successful and included several events, a major publication called Our Dublin and an exhibition. With the success of the Dublin Project, DCC enlisted the help of the IwB on another project. DCC was looking at ways to encourage small business startups and entrepreneurship in the City of Dublin. To this end the IwB and DCC, with the help of the Dublin Enterprise Board and The Digital Hub (in Dublin), conducted the “Startup City” event to redesign city supports for enterprise in Dublin. This event was held from July 4th to 5th, 2013, in Dublin. Over two and half days teams proposed a range of solutions that could realistically contribute to the success of startups in Dublin. This challenge included identifying new options to make Dublin the easiest place to create a startup and develop ways to test and prototype the concepts and service improvements to the enterprise support system already available. How can Dublin effectively encourage, support and create opportunities for the city’s startups and entrepreneurs? Following a period of fast economic growth known as the Celtic Tiger boom, Ireland experienced rapid economic downturn starting in 2009. In the last few years, the city has experienced a host of challenges due to the economic crisis, including derelict properties, rising crime rates, and disinvestment. In this economic climate, microenterprise development becomes an important tool to strengthen the sustainability of local economies by providing employment within local communities. Irish Enterprise support has traditionally been provided by a range of diverse national and local bodies, but in recent years this startup support system has changed and become more directly led by the DCC. DCC now works closely with the Dublin City Enterprise Board, directly supporting the Local Enterprise Offices (LEO’s) and the Digital Hub, which is a cluster of digital content and technology enterprises in Dublin that foster innovation, technological development and creativity in a supportive, entrepreneurial environment. This changing support system environment for startups in Dublin provided an opportunity to examine how these and other city systems, resources, and assets could be leveraged to support early business development and social entrepreneurs. The Startup City charrette gathered key stakeholders from the startup community in Dublin, including local and international startup experts, entrepreneurs, Dublin local authority staff, enterprise and commercial agencies and organisations, and other non agency participants. For the purpose of the charrette, “startup” was understood in its broadest sense and used to describe small companies in the early years of their development, usually considering companies with 10 or less employees. More than 80 people participated in the Startup City charrette in Dublin. Participants were divided into eight charrette teams, each team was given a focus theme to guide the proposal development. Themes included enhancing the current startup system, procurement, developing markets, and developing prototypes. Metrics like financial planning, process simplicity, system adoption, implementation rate, and readiness were used to evaluate the proposals. On the whole, the teams emphasized streamlining communication around resources for entrepreneurs, enabling greater business-to-business networks, and increasing the financial and resource support for entrepreneurs. 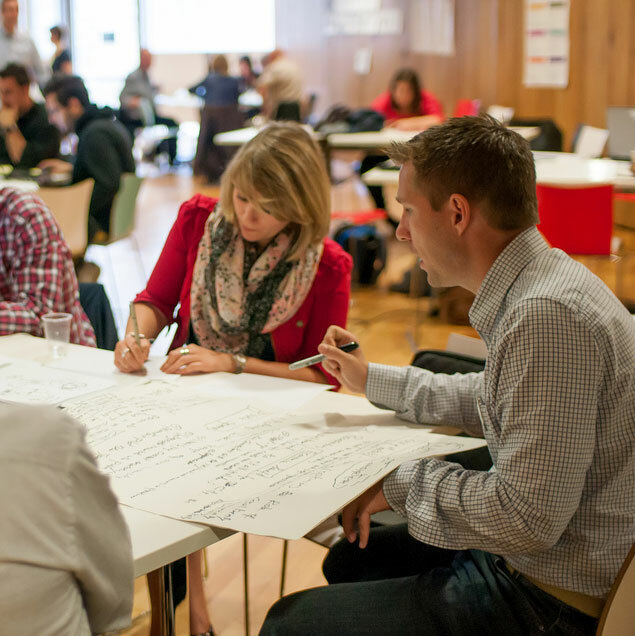 The charrette produced tangible ideas for developing the startup culture in Dublin. With these results the city was able to put together a concrete list of priorities and recommendations called the Dublin Agencies’ 2014 Priorities List. These results as well as the full charrette presentations and proposals were summarized by the The Studio, a division of Dublin City Council, in November 2014. See the link to the report below. Startup City: Outcomes from the co-creation event to redesign city supports for enterprise in Dublin. Team 1 dealt with the theme of enhancing Dublin’s startup ecosystem. Dublin has had success in generating a diversity of entrepreneurial activities. Many public and private organisations support and contribute to their early stage development. While successful companies continue to emerge in Dublin, could these tacit and implicit supports be more effective? And what must Dublin do differently to better support and encourage a thriving mix of startups and small businesses? This team proposed several ideas including a new business platform called ‘Start Dublin’ to take on the role of communication and coordination between the various business support agencies. The ‘Start Dublin’ platform would provide a seamless experience for the user and better use of resources by leveraging existing city assets. The team also proposed developing business-to-business support networks, for instance a ‘Start Dublin Clubcard’ that would allow entrepreneurs to trade services, products or mentoring services through a point based barter exchange system. Read more about the “Enhancing Dublin’s Startup Ecosystem” in the Startup City: Outcomes from the co-creation event to redesign city supports for enterprise in Dublin. View the full project presentation here. Team 2 investigated the ways in which Small to Medium Enterprises (SMEs) could be included more in tenders for goods and services that are issued by public bodies. Current reform to procurement regulations (e.g. grouping large tenders together across local authorities or other public sector bodies to achieve efficiencies and discounts through bulk purchasing) means that SMEs may find it more difficult to sell to public bodies, and additionally, that public bodies may find it more difficult to source goods and services from small companies. The team proposed 3 ideas around the issue of procurement and purchasing power. These included more exible use of existing procurement provisions, increasing the communication between the different parties involved in procurement, and recommendations on how small firms could come together to improve their opportunities to win public contracts. Read more about the “Purchasing Power” in the Startup City: Outcomes from the co-creation event to redesign city supports for enterprise in Dublin. Companies in Dublin are developing a wide range of applications, products and services for a worldwide market. Products as diverse as street furniture, intelligent sensors, low carbon lighting, green building technologies, play equipment, corporate applications or new city initiatives need real world testing. What if Dublin City Council and other public and private organizations in Dublin could facilitate prototyping for high potential products or services developed in this region, for later sale worldwide? Team 3 investigated how Dublin could become the ‘global city of choice’ to prototype new products and services. Key for a city in achieving this aim is transparency, public participation and open data. This team proposed that a single agency or ‘Prototype Dublin Office’ be set up that could act as an interface and dynamo between entrepreneurs/ industry and the city and its partners, to provide spaces, properties, training, mentoring, expertise, funding, etc. for the fast prototyping of ideas. This Office could be part of Dublin City Council and could coordinate information, gather data, support events, provide professional support and allocate resources to ideas being prototyped. It could also offer guidance on issues like health & safety, public procurement etc. Read more about the “Prototyped in Dublin” in the Startup City: Outcomes from the co-creation event to redesign city supports for enterprise in Dublin. There is a complex system of financial support and funding available for startups in Ireland dependent on trading status, sector, location etc. The range of grants and funding streams can be confusing due to differing eligibility criteria, terms and conditions etc. The systems can be slow to react to emerging sectors and market demands. There may be gaps and overlaps in funding streams. Further, the range of funding support is inhibited by government policies and it is said that this support has a “one size fits all” approach. Within current constraints, how could Dublin develop additional sustainable funding models that would make a real difference to the early years of a company in Dublin? Team 4 addressed three key areas around funding: lack of available funds, confusion about how to access funding information, and the need to better prepare entrepreneurs for starting and running a business. The team proposed creating a Dublin Startup Fund that could be set up as a partnership between Dublin City Council, Blue Chip Businesses, Banks, EU Funding Sources and Citizens etc., called the Dublin IDEA Fund (Innovating Developing Educating Accelerating). The new fund and programme would align with Dublin’s Economic Plan, deliver free and accessible mentoring to ensure the success of startups, enhance partnerships between the public and private sectors, and provide funding for startups. Read more about the “Show Me the Money” in the Startup City: Outcomes from the co-creation event to redesign city supports for enterprise in Dublin. Many entrepreneurs chose to locate in cities or regions where they feel the best supports or markets are available in order for their company to succeed. These cities or regions from across the globe are vying with each other to attract and retain high potential entrepreneurs. What is the story that Dublin would like to communicate and to whom? What more can Dublin do to compete with these cities or regions? Team 5 needed to be able to articulate Dublin’s successes and strengths. The team recommended developing a strong brand that is underpinned by a suite of actions that deliver on their promise. Research with startups revealed that Dublin has great benefits, from the availability of tax incentives, to the speed of setting up a company. However, while the city may be good in some areas, other areas were found to be lacking. The group identified a suite of priority actions that could address the gaps. It was proposed that a brand for Dublin City would be a living and growing brand, but that additionally, it would be honest and realistic. An ideal ecosystem for startups was analysed consisting of 6 elements that would enhance Dublin’s brand: vibrancy, super-connectivity, talent, prototyping, cohesion of business support, and funding. Read more about the “Once upon a time in Dublin” in the Startup City: Outcomes from the co-creation event to redesign city supports for enterprise in Dublin. Dublin has a range of enterprise spaces run by the public and private sectors that serve companies in their early years. Many of these are currently operating at capacity. Startups in food manufacturing, makers, and business support services in particular are reporting difficulty in locating suitable premises for startup and subsequent stages. Given existing constraints, where and how can these spaces be provided? 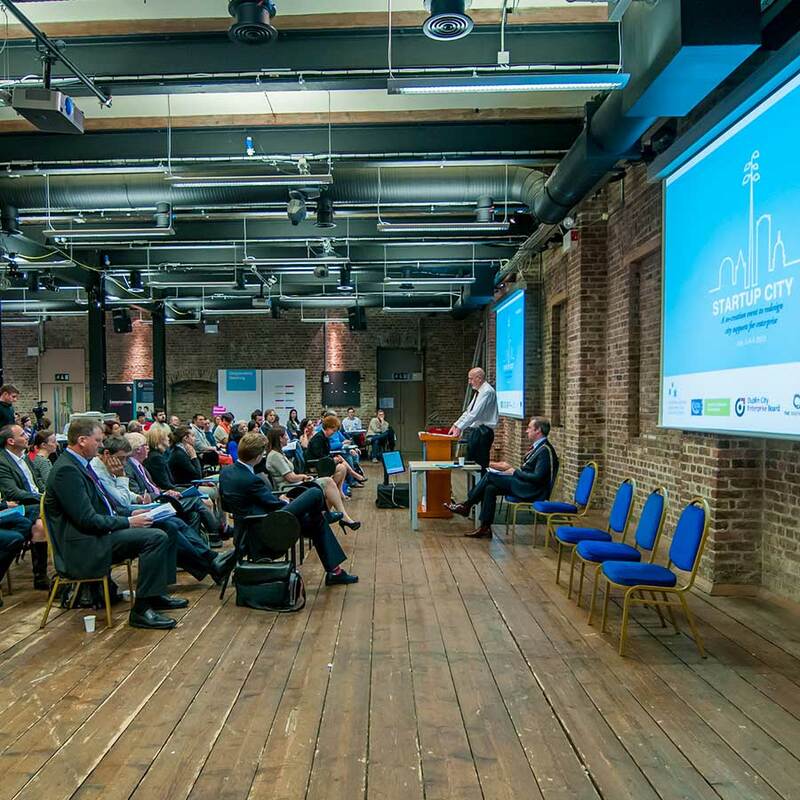 Read more about the “Enterprise Spaces and Places” in the Startup City: Outcomes from the co-creation event to redesign city supports for enterprise in Dublin. Many successful Irish and International household brands first started selling their products on market stalls. Markets are particularly attractive to the food, craft and fashion sectors due to the low cost of entry. Dublin City Council supports a range of private market activities on parks, streets and other locations across the City and wishes to refurbish the old City Markets building on Mary’s Lane, Dublin 1. New indoor markets have developed in a number of locations. What further opportunities could be developed by markets across Dublin? Many markets operate in tandem with events or festivals in the city. How can the city encourage more of these activities? Currently, there is no strategic plan for how markets or events should happen in the City of Dublin, for instance where and when they should happen, what size or type they should be, who should run them etc. Setting up a strategic plan and charter for markets generally throughout the city would support startups by allowing them to test the sale of products. Team 7 proposed developing a citywide markets and events charter that would provide more information on setting up markets with a simplify the application processes as well as setting up an incubation and mentoring programme for startups. The team also suggested making guidance more accessible on setting up stalls and simplifying the application procedure, as well as an incubation and mentoring program for startups. 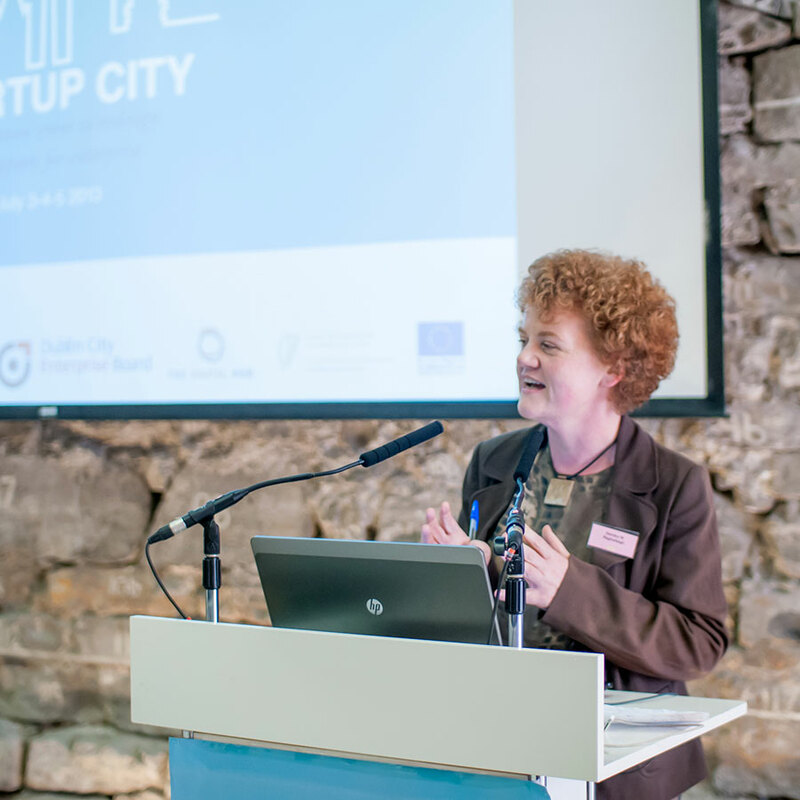 Read more about the “Developing Markets & Holding Events in Dublin” in the Startup City: Outcomes from the co-creation event to redesign city supports for enterprise in Dublin. Food is an important part of the experience of living in and visiting the city. The food chain and the different food channels (production, manufacturing, etc.) are a revenue source for a large number of businesses in Dublin City. Those setting up a cafe or restaurant comment about the myriad of regulations encountered from multiple agencies including the City Council. These regulations include everything from food hygiene, fire safety, drinks licenses, signage and advertising, to permits for pavement tables and chairs. How could the city make these interactions easier for new food outlets? Team 8 proposed that a dedicated sector in the new Local Enterprise Office (LEO) could be set up to provide training courses, mentoring, networking opportunities etc. for businesses in the restaurant sector. Ideally a member of staff would have expertise the restaurant sector and could be assisted by industry experts for mentoring purposes. Read more about the “Making Food Easy” in the Startup City: Outcomes from the co-creation event to redesign city supports for enterprise in Dublin.